27 Auburn Gresham Free Tax Site 2018 Opens! 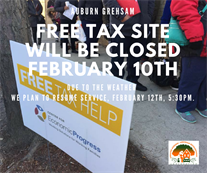 Auburn Gresham Tax Site Closed, 2/10, Due to Weather! PLEASE NOTE THAT THE AUBURN GRESHAM TAX SITE WILL CLOSED TOMORROW (SATURDAY, FEBRUARY 10TH) DUE TO THE CONTINUING HEAVY SNOWFALL! Auburn Gresham File Taxes For Free Until April 18th! 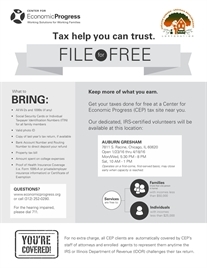 2016 Auburn Gresham Free Tax Site, starts Saturday, January 23, 2016. There is a new and improved locaiton, thanks to the upgraded, St. Sabina Community and Technology Center. The new location is 7811 S. Racine. Just 1/2 block away from the old site. The requirements are the same.It is still first come, first served. Doors open about 1 hour before start time. New large capacity waiting room. Pass the word!